Option 1. Heart Use shimmer glass paint to create a design onto the heart. 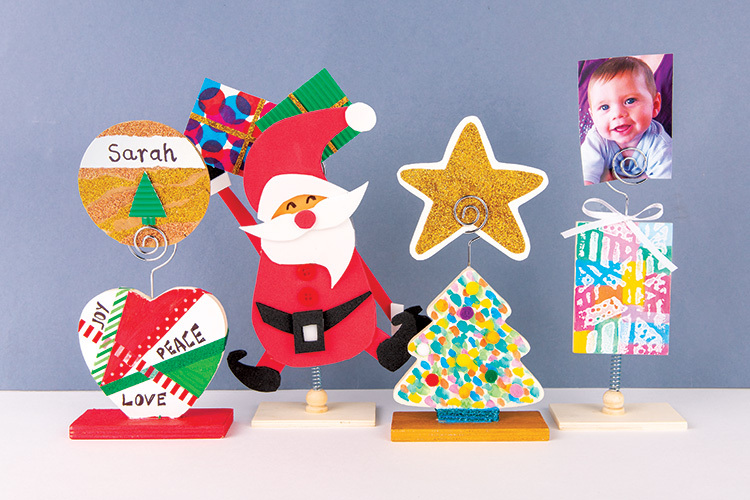 Use washi tape to decorate, and write on words that symbolise Christmas. Option 2. Santa Cut clothing shapes from craft fun foam sheets to create your Christmas character. Glue all the pieces together and glue onto a wooden photo holder. Add additional embellishments such as buttons and drawn-on features to complete your character. Option 3. Tree Paint a background onto the tree with Poster Colour paints. Decorate with pom poms and metallic yarn. Option 4. Present Use Posca Markers to create a coloured background on the Wooden Photo Holder Rectangle and create a print with Printing Foam to overlay on the background. Decorate with satin ribbon.